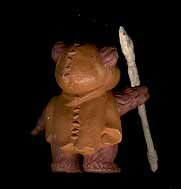 This newly-discovered piece from the Ewoks line represents an early sculpt for the Wicket figure. As you might be able to tell by comparing the photographs below, it differs substantially from the toy that was eventually released. For one thing, the eyes of the concept piece are larger and more elliptical and they have more prominent lids. Additionally, the shape of the face is more diamond-shaped than round and the mouth has a more puckered look to it. Other, more subtle differences in sculpted detail can be found upon closer inspection, including several relating to the cowls of the two figures. But the most notable characteristic of the protoype is its construction: it's made of one piece of urethane material, not of several parts. 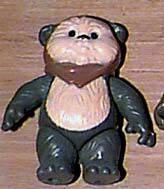 It is my opinion that Kenner never intended this prototype to lead directly to a finished figure. It's more likely that it was sculpted quickly and in one piece, so that hardcopies could be made of it, painted and used as photographic samples in catalogs and other promotional materials. 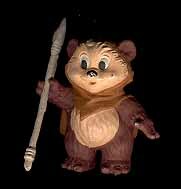 In fact, a figure identical to this one makes an appearance in Kenner's 1985 Toy Fair catalog alongside a similar one-piece conceptual hardcopy of the Ewoks Logray figure. It's possible that this piece was created prior to Kenner's receiving final design specs from Lucasfilm regarding their animated characters. If this was indeed the case, Kenner, realizing they'd need photography samples far ahead of the line's debut, may have went ahead and made these early versions as a safety measure. Later, when the character designs were finalized and approved, work went ahead on the production sculpts. Any way you look at it, this is a neat piece. I actually like the cartoony look of it more than I do that of the production figure.